Start your morning off right with one of these hot ham, egg, spinach, mushroom and cheese sandwiches. This easy-to-make recipe will soon make your morning takeout a thing of the past. Brush dressing evenly onto mushroom and ham. Cook in medium nonstick skillet on medium-high heat 2 to 3 min. or until mushroom is tender, and ham is heated through and lightly browned. Remove from skillet; cover to keep warm. Heat oil in same skillet on medium heat. Add egg; cook 2 to 3 min. or until egg white is set and yolk is cooked to desired doneness. 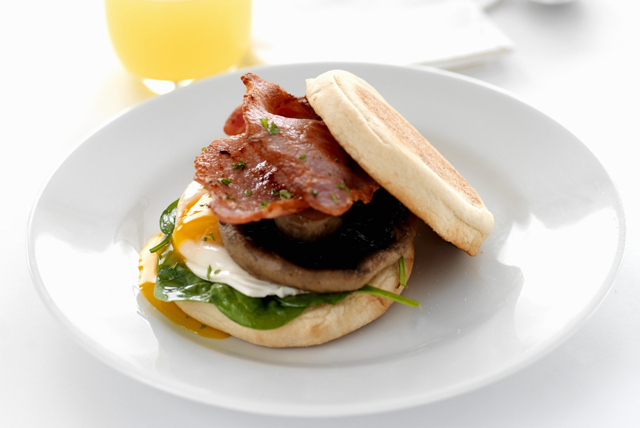 Fill muffin halves with spinach, cheese, egg, mushroom and ham. Sprinkle 1 Tbsp. chopped fresh parsley over ham slice in sandwich before covering with second English muffin half. Substitute 1 cooked bacon slice for the ham.